Ellis Island, just off the southern tip of Manhattan, was the gateway to a new life in the USA for immigrants arriving between 1892 and 1954. Despite the closure of the complex many years ago, the grand buildings still remain intact, including the huge welcome hall and the whole place is now a national immigration museum. Many original features remain so you get a real taste of what it would have been like to arrive as an immigrant. A self guided tour operates over the three floors of the museum and it’s a bit like walking through time. You’ll see the quarantine rooms, medical facilities and several areas where new arrivals were processed. If you’re a fan of the Godfather movies you’ll recognise several locations which were depicted in the Godfather Part II when Vito Corleone arrived in the USA. 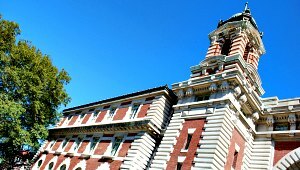 Ellis Island is fascinating and shouldn’t be missed on a trip to New York. You’ll need to allow 2-3 hours to do the place justice and if you have a ticket for the Statue of Liberty too, you’ll need to allow lots of time to do both attractions, including getting from one to the other. Ranger guided tours are available for free, but if you chose the audio tour, there is a fee of $8 (2012 prices). Ellis Island is free to visitors, but you’ll need to get a ferry to get there. The ferry operator for both Ellis Island and the Statue of Liberty is Statue Cruises. The first ferry from Battery Park is at 8.30am and the last ferry back is at 5.15pm and the adult cost is $13 (2012 prices).